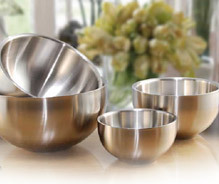 You can choose our variety of stainless steel bowls according to your needs, adding glitter to your dining table. Easy to clean, our stainless steel bowls can be used for varied purposes such as for salad mixing, snacks serving and many others purposes. 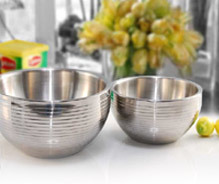 Double wall stainless steel body enhances the life of these bowls. Superior polish and perfect finish lend them extra charm. We specialize in manufacturing them in both standard and customized forms alike. 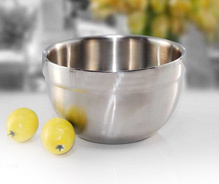 Fine quality stainless steel salad bowl – This is ideal to decorate salad for small servings and present it in a stylish way. 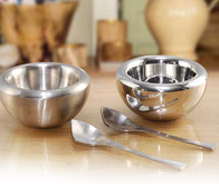 Available in two sizes, this tilt bowl is having a firm base for stability yet it is to take servings from. A must have item for every dining space – home or restaurants or even hotels. 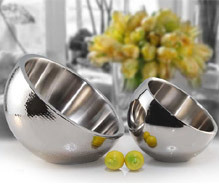 The finest quality stainless steel double wall snack bowl is ideal for those who are looking for a stylish and high quality serving-bowl. 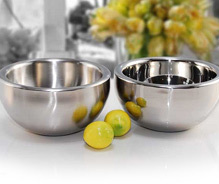 We offer the finest quality stainless steel belly bowl with hammered finish. This is an elegant piece of earthen look. 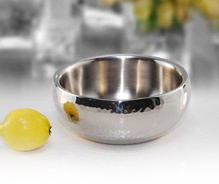 This german bowl is made of high quality stainless steel and is available in three sizes. We even custom design them as per client’s requirements. This snack bowl in double wall is available in attractive packaging. This salad bowl with sober design patterns is simple yet elegant – ideal for an understated statement of style. 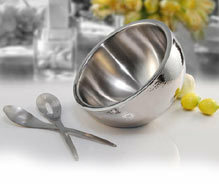 Create your own unique style of salad serving in your own home with this exclusive salad bowl.